7 Minutes Daily Profits Review - SCAM? 3 RED FLAGS exposed! Home > Online opportunities > 7 Minutes Daily Profits Review – SCAM? 3 RED FLAGS exposed! Have you come across this system and are wondering if it’s legit? 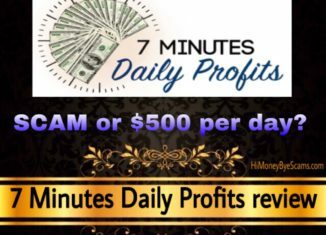 Or is 7 Minutes Daily Profits a scam that will leave you out of pocket? If you have questions like these, I’m glad that have found this post because here I reveal the complete truth about this product. You see, there are too many scams out there, so doing your due diligence is the way to avoid frauds and discover the genuine way to make passive income online! When it comes to 7 Minutes Daily Profits, it’s very similar to other products I have reviewed so I know how it works, what to look out for and more. Make sure you read this review until the end to determine if 7 Minutes Daily Profits is for you or not. 2 What is 7 Minutes Daily Profits about? 4 7 Minutes Daily Profits scam signs revealed! Someone sent me an email concerning the 7 Minutes Daily Profits system, so I thought I would check it out to determine if this one was worth it or just another dangerous scam. Honestly, just after reading the name I didn’t have high hopes because it sounds as if it only took 7 minutes to start making money, when the truth is that it takes way more than that. But I didn’t want to think it was like the others, so I took the time to do my homework before reaching a final verdict. According to the spokesman, you have the chance to use a free money-making software to start making $500 per day just after getting started. Oh, and you only need to spend 7 minutes a day to make this kind of money, so you can earn money while sleeping & travelling. Sounds cool? Lol if only making money online was that easy… Everything they claim makes this software look like a get-rich-quick scheme that only works for the owners. You see, if this software is free, why haven’t they spent their time & money on creating the sales presentation? It definitely makes no sense that they are going to help you make money for free. The truth is, they first tell you this is free to get you excited so that you stay watching the sales video. And at the end you realize that it costs at least $9, so it’s not free. I personally don’t like the fact that they are using deceit to market this product. They are giving potential customers false expectations, so how can we trust the people behind 7 Minutes Daily Profits? There’s no need to mislead or lie to people to make sales. They basically tell you everything you would like to hear. Doesn’t it make you suspect the fact that it sounds too good to be true? Yes, they tell you that you will not become a millionaire overnight, but this is something they say to make you think that this is not a get-rich-quick scheme. After having reviewed hundreds of products like this, I can say that many scam artists tell you that you will not become a millionaire quickly or that they have been scammed to gain your trust. But if they promise that you will start making money easily or fast, it can also be considered a get-rich-quick scheme because there’s no such thing as making hundreds of dollars the same day you get started. 7 Minutes Daily Profits is not about forex, MLM, paid surveys or pyramid schemes. It’s about making money with affiliate marketing. As an affiliate marketer, your job is to help companies or other individuals sell their products & services. When someone buys something through the link they provide you with, you earn a commission. It’s actually simple to understand, but it’s not a way to make money fast and it definitely takes effort. You will definitely not make a dime by only working 7 minutes per day. If you purchase 7 Minutes Daily Profits, you will not get a system or software that you just have to activate to start making affiliate commissions. They claim it’s done-for-you to lead you to believe that you don’t need to do much work, but the truth is that you will not make money with what they give you. You will get some basic information about starting an affiliate marketing business and some kind of done-for-you website. However, a website doesn’t make any money itself. You need to work on that website and drive traffic to it in order to make money. Also, you need to make sure that your affiliate offer is relevant to your visitors and can benefit them. For example, you can’t expect to make sales if your affiliate offer is a book that’s written in English and your visitors are non-English speakers. Another problem I see with 7 Minutes Daily Profits is that they don’t provide the training and tools you need to make the kind of money they talk about. This product doesn’t take away all the work and time that you are required to build a successful business. There are no push-button systems or shortcuts that work. Yes, it’s completely possible to earn $500 a day but you don’t need the 7 Minutes Daily Profits program because it doesn’t provide anything special or different than other ClickBank products I have reviewed. Done-for-you systems never work as advertised. They basically work for the people who have created them, not the people who purchase them. You can ask any successful affiliate/Internet marketer out there and you will realize that they didn’t become successful thanks to a done-for-you system. They had (and have) to work hard and smart to achieve their success. 7 Minutes Daily Profits scam signs revealed! Ready to know the red flags and lies they have told you? Well, I’ve mentioned some of them before but now I’m going to expose the big ones. The spokesman claims to be Vince Howard, who is also the alleged owner of 7 Minutes Daily Profits. He says that he has been featured in magazines and he claims to be the “$500 Daily Profit Maker”. Honestly, I don’t believe him. He doesn’t show up, he doesn’t let us know how we can get in touch with him and he doesn’t even say if he has a website or platform. I mean, if he’s making money online and has allegedly been featured in magazines, he must have a platform or website, don’t you think? He must be doing some kind of online activity. Because of this, I believe that Vince Howard is not a real person. Well, I’m 100% convinced that he’s not the real owner because he shows a fake picture of his family. The fact that he’s not being transparent about his identity is something that makes me not trust the owners of 7 Minutes Daily Profits. When someone creates a valuable product/service, they don’t need to lie about who they are. Don’t you agree? Many of the programs that hide the people behind them tend to be frauds, so I’m not trusting websites whose real owners don’t reveal their identities. Another big red flag is the fact that they have used fake testimonials to make us believe that this product works. Yes, the people who appear in the sales video and claim to have earned thousands of dollars with 7 Minutes Daily Profits are not genuine testimonies. I recognized them because they have appeared in other misleading sales videos. For example, this woman below has appeared in Insiders Cash Club and FastProfits.online, which were the kind of products that overpromised and underdelivered. As you can see, she’s on Fiverr. 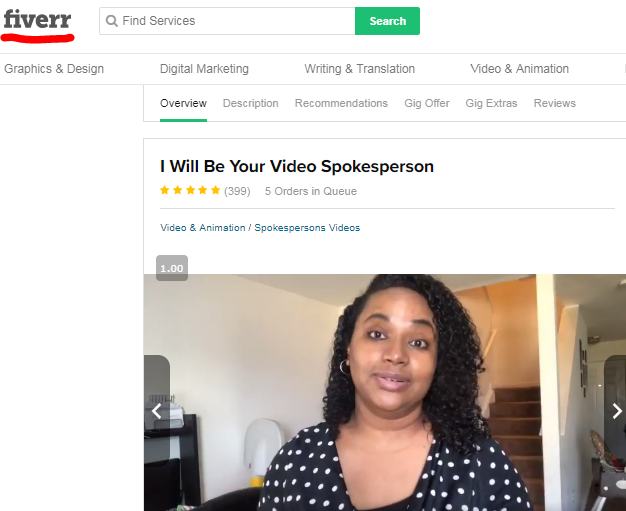 Many con artists usually hire these Fiverr actors to make potential customers believe that the scammy product works. This is proof that 7 Minutes Daily Profits does not work as advertised. Something that I want to point out is that it doesn’t only cost $9. You see, it would make no sense that they only wanted to earn $9 for each customer. There are lots of products that are being promoted as cheap and then have upsells that cost hundreds of dollars. 7 Minutes Daily Profits is very similar to another product called Bulletproof Profits, which I recently reviewed. This product has a very similar sales page and structure, so I believe that the owners are the same people as the owners of 7 Minutes Daily Profits. If you end up spending $9 to get access to the members area, you will be immediately hit with some upsells. They will try to make you pay hundreds of dollars, just like it happens with other products. They will tell you things like “you will increase/accelerate your profits” to make you believe that you need those upsells. But it’s all hype. If they have lied in the main sales presentation, what makes you think that they are not going to lie again? In case you refuse to buy the upsells, they will send you some emails to convince you to buy other “make money online” products. Oh, I almost forgot. Another lie they tell you is that the page will be removed at midnight. This is a fake scarcity tactic that scammers use to make you buy on impulse. Is 7 Minutes Daily Profits a scam? If you are still wondering it, the answer is up to you. There are people who will not call this product a scam because you get some training for your money. Other people will consider 7 Minutes Daily Profits a scam because it’s very misleading and it doesn’t live up to its promises, since it will not help you make money fast or $500 per day. Like I said, any successful business takes time and effort to build, and there are no products or websites that can take away all the work required. If making money online was easy, most people would have quitted jobs they hate and many people wouldn’t be struggling. So don’t be fooled by scammers who promise you easy riches. In my opinion, 7 Minutes Daily Profits is not a total scam because it’s sold on ClickBank, which means that you can get a refund if you buy it but end up not liking it. I personally haven’t bought it because it’s not worth my time, but you can do whatever you want. I hope you found this 7 Minutes Daily Profits review helpful. After everything I have explained, I have to conclude that I do not recommend 7 Minutes Daily Profits. I make a full-time income doing affiliate marketing. Yes, that’s the business model that they teach in 7 Minutes Daily Profits, but I use a different method. I don’t need to rip people off to earn passive income every day. Not everyone who makes money online lies or deceives other people. When I was getting started, I thought that the only ones that could generate an income from home were professionals or scammers, but I was wrong. I’m glad that there are people who started with no experience and have managed to achieve success by helping others. Affiliate marketing can be an amazing business model when you use it the right way, you just need to learn from an updated step-by-step training and take action. I have to confess that it took me a lot of work to reach this point, and I have to keep working to reach the next level. If I can do it, anyone can do it too. I started out without experience or tech skills, and English is not even my native language. So, as long as you are committed to putting in the work and time, I believe you can do this. You probably have lots of doubts now, so I hope that, after reading my free guide, you will have a clear idea of how to this business works. Oh, and didn’t I mention that you can get started today for free? See all the details in my guide! I hope this 7 Minutes Daily Profits review has been useful to you and you will make the best possible decision. Well to me, the title ‘7 Minutes Daily Profits’ is a dead giveaway right from the start, as it actually sounds like a scam product. When you combine the fact that the thing is only nine dollars (with the dreaded upsells of course! ), then you know it’s probably trash. At the end of the day, who would be mad enough to sell this sort of secret for only $9? Thanks for offering your thoughts! You are right, it makes no sense that they are selling a valuable product for only $9, it’s clear that it doesn’t work like they say. The fact that any successful business takes time and effort to build, and there are no products or websites that can take away all the work required then any other fast money making way that can not keep to their promises is a scam to me. I think here is where creativity comes in, haven known what they are upto, doing it in a different way to make money would be the best. I like your idea, affiliate marketing is indeed the big fish. This is a great informative and educative product review about 7 Minutes Daily Profits. I have just finished reading this fantastic review about this. After reading this article, I have no doubt that this is a perfect scam and not recommended for beginners who want to earn while they learn a genuine method. I personally dislike those sites which use fake testimonial and hides real information. I believe that many beginners will find great help and proper guideline for staying out from this site. I am going to share this helpful guideline with my other friends and family members. Thanks for writing this important review. Scam everywhere! Thanks so much for sharing this great article to save allot of people including me from being scam from this people. One biggest red flag I point out was the claim of you making money within a short period, which you and I believe that’s almost impossible. If making money online was that very easy as they claim everyone would become an affiliate marketer and make it so fast. 7minute daily profit is indeed a scam, they lack to tell prospective affiliate marketers the truth, that making money online is a long term process that require hardwork, patience, consistency and determination. To make it online the just mentioned attribute must be set in first before making a dime. Thanks for pin pointing the fact that the owner of 7minute daily profit has fake identity. No real existing website that make money online that will hide it Identity. For your audience to get to trust your site you’ve to be real and you’ve to give real details of yourself. You gain people trust only when you are real. The fact of using false testimonial actors is another big evidence that the site is a scam. They only used those actors to get people convince that they are real. Thanks to you for able to recognize the lady on that video. It’s a great pleasure reading your article, thanks so much for sharing!